Summary: Fun strategic memory game for medium to large groups. Great for teenagers to adults! Goal: Try to get four of your teammates on the couch! – Four marked chairs or a “couch” that can fit four people. Four people must sit on the couch at the beginning of the game. 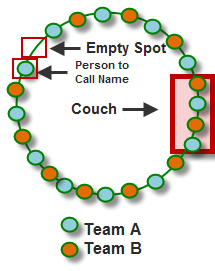 Everyone else can sit on the ground in a circle or in unmarked chairs, with the outer circle boundary including the four special chairs/”couch”. 1. Split everyone into two equal teams and ask them to sit in a circle. Add one empty seat in the circle. When starting, each participant needs to sit next to his/her opponent on both sides (alternating team members), including the four people on the “couch”. Hand out the pieces of paper and pens (one per person). Ask everyone to write their names on their piece of paper and to put their pieces of paper in the bag. 2. After this, pass around the bag and ask everyone to draw one piece of paper with someone else’s name on it. Each person should read their own piece of paper without letting anyone else know what his or her paper says. 3. Explain that the goal of the game is to get four of their teammates on the couch. The person on the right of empty chair/spot calls the name of a game participant. The person whose piece of paper has the called name sits in the empty chair. Whoever sits on the right of the new empty chair calls out another name. 4. Start by asking the person to the right of the empty chair to call a name. The person with the piece of paper with the written name sits in the empty chair. Continue this pattern. The first team to have four of their members on the couch wins the game.